20 pages. collages of xeroxes with reproductions of paintings from art history. 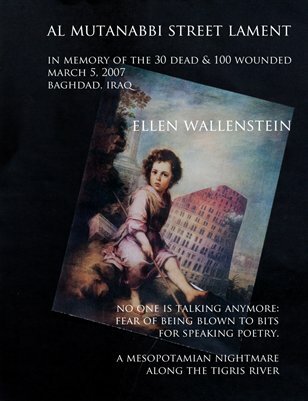 made in response to the 2007 bombing of a bookstore in iraq. showing in "the photograph un/framed" a group show at the center for book arts in new york city, july 2011, and will be part of a group show at the baghdad museum, sometime in 2012.